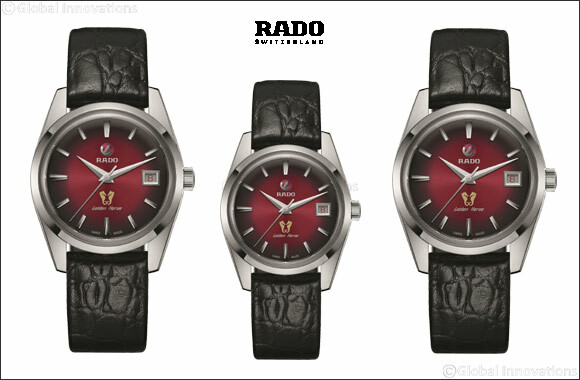 Dubai, UAE, April 04, 2019: 1957 marked the launch of the very first collection of watches under the Rado name, among them the famous Golden Horse. In a new addition to the brand’s burgeoning Tradition collection, Rado has now reimagined one of its first pioneering pieces, with a typical Rado twist. Until the 1950s, watches were traditionally passed down through families. Rado created the Golden Horse in stainless steel - a bold move in an age where precious metals such as gold and platinum were traditionally used in watchmaking. The decision set Rado apart and contributed to making the watch a fashion item and personal style statement. The brand new Golden Horse has only one intention – to be true to the original. That means that there are no unnecessary decorations, just the functional imperatives. The 37 mm stainless steel case houses the curved, crimson and black dial. With its ombré effect, it is the perfect background for the two gold coloured seahorses. Golden Horse is written across the dial in the same font as that used in 1957. The date window at 3 o’clock has red numerals on a white background, an unusual but readable touch. The signature moving anchor symbol, which now appears on all Rado automatic watches is also true to the original. The printed calf leather strap uses the crocodile pattern from the flank – a design very common in 1957 but not often seen today. Even a glance at the case back couldn’t separate the original and current editions. Three seahorses and three stars are proudly arranged to show that the case back is screwed to the case. As you’d expect at Rado, a company with one eye firmly on the future, there are some modern tweaks. Sapphire crystal, now a feature of all Rado watches, replaces the acrylic glass used for the original and the quality, Swiss made ETA automatic C07 automatic movement offers a power reserve of up to 80 hours. It all goes to show that Rado remains in touch with its illustrious past – a connection to a rich design heritage that cannot be ignored.